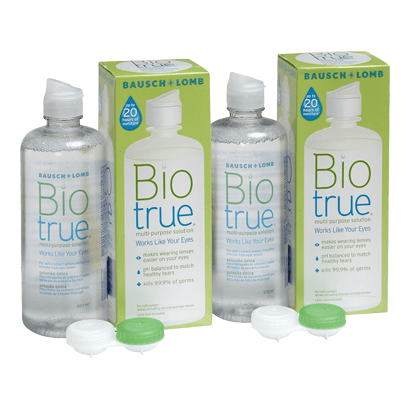 The Biotrue Duo Pack includes two bottles of solution and two contact lens cases, ideal for wearers who want to stock up. This product is too big for letterbox-friendly delivery, but the everclear Flat Pack Multi-Purpose Solution 3 Pack will fit through your letterbox easily and has received an overall 5-star rating from our customers! Review Biotrue Duo Pack Stops eyes drying out and does not irritate my sensitive eyes. Great product. Review Biotrue Duo Pack Easy to use and smooth feeling! Review Biotrue Duo Pack This has made such a huge difference to my dry eyes, I can now wear my contacts for as long as I need with no dryness or eye drops required! Review Biotrue Duo Pack Pretty good! Review Biotrue Duo Pack The only solution that i don't feel like chemestry in the eyes. And very easy to use. And pretty good price from VisionDirect. Review Biotrue Duo Pack What a difference this product has made to my contact lenses. I have tried a number of products always having the same problem with dry eyes when i get tired, eyes irritated at times. Using Bio true my contact lenses are so comfortable. The only downside is a little expensive. I brought this product after reading the reviews on this site. Review Biotrue Duo Pack I was sceptical when reading about this product being just like one’s eyes fluid. However the viscosity of the liquid is perfect, not greasy at all. I work in a dusty stressful environment (the worst for contacts) however the whites of my eyes are still white at the end of the day. I had previously developed a sensitivity to another similarly priced product, this solution provided an excellent alternative and saved me relying on glasses. Review Biotrue Duo Pack I have been used this solution for years, always my first choice. Review Biotrue Duo Pack I have used Biotrue for a few years as my everyday solution and find it one of the best that I have tried as it cleans well, my lenses are very comfortable to wear & it appears less chemically harsh. It is also definitely better value for money when bought online. Review Biotrue Duo Pack The Optician provided this product with my Son's first contact lenses and have continued with it as so easy on the eyes, my son won't change! Review Biotrue Duo Pack This is a really good contact lens solution. I was impressed by the price and the service I got by buying through Vision Direct - I just wish I had found them sooner! Review Biotrue Duo Pack Great stuff ! Review Biotrue Duo Pack Wearing contact lenses stay very comfortable all day long with this cleaning solution. It feels very natural and gentle. It comes with lenses case so fresh new case every new bottle open. Biotrue Duo Pack I have tried many solutions before but like this one the best. It makes my contact lenses more comfortable than all the other solutions I have tried so far. Biotrue Duo Pack I have used this solution for years. Clears my lenses just fine. Biotrue Duo Pack Great product and very pretty bottle that looks really nice in my bathroom. Biotrue Duo Pack Great solution that keeps my lenses comfortable after cleaning! Biotrue Duo Pack Really great product that I have used for years. I removes deposits on my lenses easily and effectively. Bottled magic You sent me a complementary pack of this with my lenses. THANK YOU! I have always used a supermarkets own brand as they seemed as good as any I tried & I try to save money. I wear monovision toric lenses & have problems with them as my eyes dry out, they stop moving freely - affecting my reading vision and making it very hard at work, I was getting fed up with always pulling faces and having to move my lens with my finger or use Refresh drops - great for a short while. THIS STUFF IS MAGIC, comfort from the moment of insertion, my eyes stay moist and comfortable all day so my vision is stable and I don't get frustrated! No more need for wetting drops. I hate the price but I shall have to stick with this wonderful solution! The specifically formulated solution works on the eyes in a perfectly balanced way, taking into account the natural hydration of the tear ducts in order to create comfortable hydration for hours on end. The innovative care solution is inspired by the natural alignment of the ocular properties found within the eye and can keep the beneficial proteins and fluids active and in perfect shape.